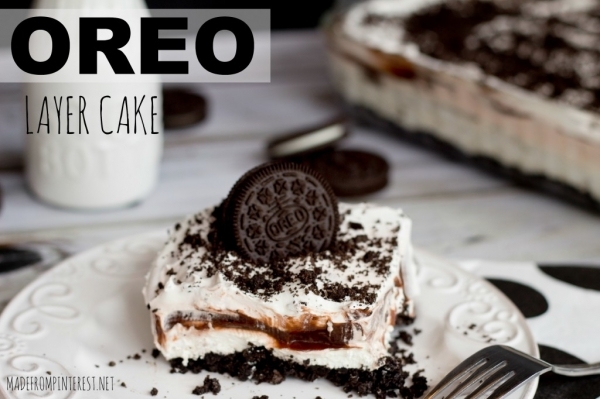 Unbelievable Oreo Layer Cake Recipe YUMM! In a food processor or blender, blend the entire package of Oreo’s until fine crumbs . Set ½ cup of crumbs aside for the topping. Pour the rest of the Oreo crumbs into a bowl. Melt your butter and pour into crumb mix. Mix until the butter is well incorporated and then press the crumb mix into a 9×13 pan. Prepare the chocolate pudding according to package directions and let set in the refrigerator. Combine the softened cream cheese and powdered sugar and mix well . Fold in one 8 oz carton of Cool Whip. Pour the cream cheese mixture over the oreo crumb crust. Then add the chocolate pudding and then the second carton of Cool Whip. Sprinkle the ½ cup Oreo crumbs on the top. Cover and chill under ready to serve.